It’s a strange film for director Mark Romanek to decide to make. Having had a history of making music videos, he branched out into features with “One Hour Photo” – which I adored and still enjoy watching having watched it again on my Sky Anytime last week. But what brought him to “Never Let Me Go”? The tale of three children living in some weird, parallel universe where humans are manufactured to donate their organs until ‘completion’ – otherwise known as dying – isn’t something you’d think Romanek would attach himself to and to be honest, he shouldn’t have. Right from the off, the main problem I have here is I have no idea of the greater concept here. I enjoy tales about small lives in a changing world, whether it’s blockbusters like Spielberg’s War of the Worlds or Night of the Living Dead or The Road – the idea of putting normal people in extraordinary situations is an age-old popular trait. 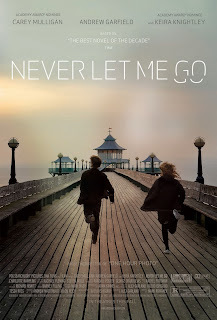 However, with Never Let Me Go the children in question aren’t ordinary and what is actually happening here is drip fed throughout the film in tiny tid-bits that aren’t enough to hold my interest. I want to know why humans are brought up to donate, what decision was behind this, why set it from 70’s to 90’s Britain, what other methods they have been doing, why the school was supposed to special? Everything is hinted on and even answered in some cases, but not to the extent or depth that I wanted. I’m not saying I want to be spoon fed information but I want to be given enough either from the start, or before certain events occur, that put the rest of the film and certain decisions into context. Then again, I’m putting the film into literal terms. I’m sure there are deeper levels at work here that are probably more profound in the book, but instead they reveal themselves during the final scene as Carey Mulligan ponders death and love and it feels too little too late. I just can’t justify that this is an intelligent, creative film – instead it has been handled poorly and it’s just boring. The only thing that kept me going through it was trying to find out the reasons for all this cloning, donating and how it’s supposed to work in society but you only ever get the viewpoint of Carey Mulligan who has little or no interaction with the ‘outside’ world, whom I guess are just OK with this. Why haven’t they run away? Why are they obliged to donate? Why is it so good to ‘complete’? I wanted to know more and was left completely unsatisfied – I couldn’t give a toss about the love story, but they are guessing that you do – baring in mind the couple don’t get together until near the end and these characters are so detached from your sympathies by this point that the quiet, somber mood instead feels like indifference. To it’s credit, a lot of the shots look great and the cinematography isn’t anything amazing, but it does border on impressive. Knightley is almost sufferable and Garfield is acting by the numbers, Mulligan fortunately holds the whole film together but even she fails to impress. The adult cast are only in half of the film and the children at the beginning make me want to bang my head against a wall – it’s their situation that intrigues me, not their characters. Everyone is just so wet the whole time – moaning and emotional, or emotionless, and you don’t really see much of Britain during this period save a café. The whole ‘art as an insight into your soul’ as proof of the human condition is so disgustingly blatant that it might as well be saying ‘art is about pretty pictures’. I hated everything about this film except the mediocre acting and the fact that they are brought up just for their organs rather than for humans – farmed if you will. The lame analogy of how their completion is just like our completion by spelling it out word for word is beyond patronising. If something is based on a book, it doesn’t mean it’s clever or should be considered as such. Like a clone, sometimes a terrible film can hide amongst the others and not get noticed. If someone has read the book and feels it has done it a massive injustice then let me know but based upon this film, I’m going to steer clear of this book like it was Anthrax. If you love Knightley, she’s hardly in it, Garfield looks like his mind is elsewhere and you could spend 2 hours doing something better with your time rather than waste it on this. Huge disappointment but yet, such a good idea. Except that The Island did it with Ewen McGregor and Scarlett Johansson. If Michael Bay has done a similar film better than yours – you know you’re in trouble.